When it comes to motorbikes, safety can never be over emphasized. Helmets to prevent head injuries, which is the most common form of injury sustained in motorbike road accidents, have been one of the first lines of protection against road Mishaps. But imagine a bike that doesn't even need you to wear one. 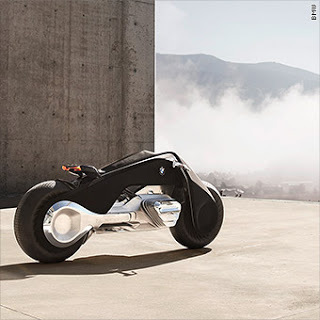 The self balancing BMW Motorrad motorbike is designed so you wont even need a helmet. It fits right into the near future, blending the analog with the digital experience and offering unprecedented safety features for the rider. Protects the rider all the way. The biker will not even require a helmet, or any other protective gear for that matter, as the bike, which also self-balances, will be able to suggest and make corrections in case of impending danger. Looks so good it feels like something Hollywood invented. The bike is stripped down almost entirely, with most information provided to the rider via an augmented reality headset, called the visor. It shows speed, navigation and the rear mirrors. The Motorrad is part of BMW's Vision Next series, which celebrates the company's 100th anniversary. For certain, this new revolutionary bike will dramatically cut down motorbike accidents and road accidents as a whole. A welcome and highly anticipated development.